Being jilted two weeks before her first attempt of marriage has left Lady Beatrix Danbury shy of marrying again but she has now found a sensible and reliable man to marry, he doesn’t stir her passions as Will, Duke of Sunderland her childhood sweetheart did, but he is dependable. But when Will returns from Egypt her well planned future doesn’t begin to look as exciting as she thought. Will has always loved Beatrix but after 6 years of being apart after she refused to come with him to Egypt he thought that would be over, but seeing her has brought all the old feelings back, and this time he is determined not to leave without her. Although I liked this book, there is one thing that stopped me from really enjoying it. Beatrix. I just didn’t understand her and she drove me just a little nuts, I didn’t see why she resisted to Will as much as she did, especially when she clearly wanted what he was offering. To me she came across as a little dull and a little priggish. Because of this I didn’t feel the connection between Will and Trix and didn’t see why Will loved her so much. Will, however, I did like, he was fun, easy going and adventurous. The other characters in the book were also likeable, especially Julia and I look forward to reading about her. Despite not liking the heroine this was a well written book and LLG writes with real emotion, I can feel Trix’s anguish and hurt even if I don’t quite understand it. Although, for me, this series hasn’t started with a bang, I liked the writing and the other characters enough that I will try out the next book. Here my wishlist grows again…adding this series to my wishlist!!!! 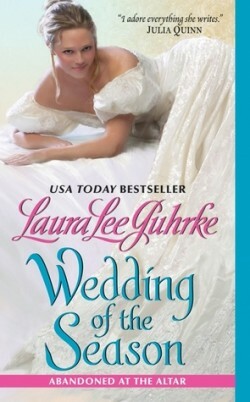 review always make me want to buy the book, nice review, thinking about buy laura;s book.